Lawmakers for the Liberal Democratic Party of Russia want to toughen the existing law on responsibility for rehabilitation of Nazism in view of the current struggle against attempts to rewrite history that is taking place in Russia and abroad. Lawmakers for the Liberal Democratic Party of Russia have proposed a bill that would punish anyone making public statements equating the USSR with Nazi Germany a criminal offence by up to three years in prison. The bill’s sponsor, Vitaliy Zolochevskiy, told Izvestia daily that he wanted to toughen the existing law on responsibility for rehabilitation of Nazism in view of the current struggle against attempts to rewrite history that is taking place in Russia and abroad. He added that in a recent opinion poll by the VTsIOM state agency 83 percent of Russians agreed it was necessary to fight against the falsification of history. 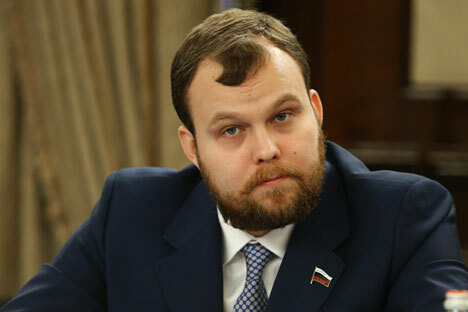 “The changes suggested in the bill are especially urgent in the year of the 70th anniversary of the victory” in World War II, said an explanatory note to Zolochevskiy’s bill. The punishment listed in the law remains the same – up to 300,000 rubles ($6,000) in fines and up to three years behind bars. Senior Russian officials, including President Vladimir Putin, have said that the attempts to rewrite history of WWII and rehabilitate Nazism are one of the major threats facing Russia, Europe and the world as a whole. Earlier this month, Putin denounced any attempts to rehabilitate Nazism in his message to the Russian-Chinese conference dedicated to the 70th anniversary of the end of World War II. “We consider the cynical attempts to rewrite history so that it matches someone’s urgent political interests, to rehabilitate Nazis and their collaborators, as absolutely inadmissible,” Putin said. “Such actions are not only immoral, they are extremely dangerous as they push the world toward new conflicts, cruelty and violence,” he said.